Over the past five years, issues in the South China Sea have only grown more complex. Claiming a historical right over most of the South China Sea and disregarding the Philippines’ victory against its claims at the Permanent Court of Arbitration, China’s presence in these disputed waters has become more prominent. The world’s second largest economy has made no secret of its military presence there which includes the deployment of anti-ship missiles, surface-to-air missiles, and electronic jammers, and, more recently, the landing of a nuclear-capable bomber aircraft at Woody Island. The United States (US) has expressed its concerns over China’s actions in the area. For Washington, it is not only the security of neighbouring states that is threatened but China’s presence in the region could also threaten the US’ geopolitical interests as well. Ever since Trump took office, Washington has expressed on numerous occasions the importance of the Indo-Pacific to the country’s security interests. The rivalry between the two countries culminated in a near collision between US and Chinese warships in the South China Sea on 30 September. As tensions between the two nations rise, and is further compounded by the escalating trade war, opinions on what is unfolding in the South China Sea differs between individual ASEAN member states. For example, the Philippines maintains warm relations with China and Duterte has kept mum on China’s controversial actions. Malaysia on the other hand has called for the South China Sea to become a free zone from any military competition and enhancement. While Vietnam has been actively working with the US and Japan to maintain its presence and claims on the sea. ASEAN as a whole has taken a relatively unified stance with regards to military activity in the South China Sea. The bloc is aware that it has little power – both figuratively and literally – to keep the South China Sea completely free from the influence of both countries. Instead, ASEAN chooses to act almost like a mediator between the two military powers with the ultimate aim of protecting the region’s interests. ASEAN as a manager of relations is based on one of its foundational values. Also referred to as ASEAN centrality, the concept sees ASEAN serving as a vessel for larger powers to serve their (ASEAN’s) own interests. Therefore, ASEAN can leverage on its centrality to further its own gains. The recent ASEAN Defence Ministers Meeting (ADMM) and its extended platform ADMM Plus highlights how ASEAN has taken proactive steps to ensure security in the South China Sea. In a joint statement after the meeting, the ministers said they are now focused on conducting joint exercises and developing protocols on maritime interactions to reduce collision risks and manage untoward incidents at sea. The initial steps towards easing tensions in the South China Sea is expected to begin next week as China and ASEAN member states will conduct their first joint maritime drills. Singapore’s defence minister Ng Eng Hen said that such drills were important to “build trust, confidence” between ASEAN and China. Some observers might feel that by engaging with China, ASEAN is siding with the Communist state instead of with the US. There are also fears that this would reduce the US’ presence in the region. However, Ng Eng Hen has chided such claims. "We do not see this as contrary to our interests," he said. "If we can have that sort of activity going on, it's transparent, something that's been lacking in the South China Sea. Then that's going to be working in the right direction." 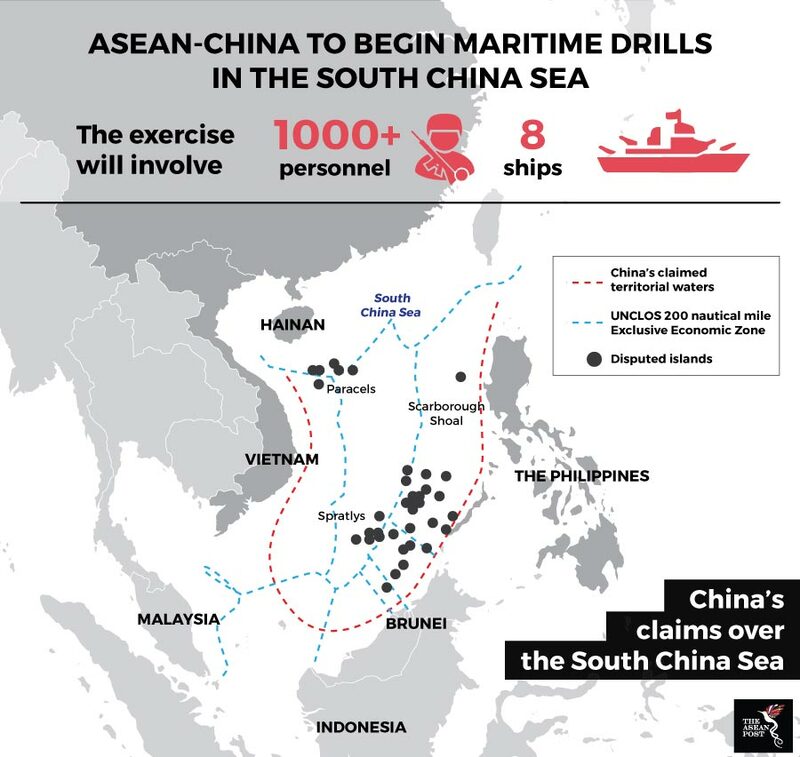 Hoang Thi Ha, an expert from the ASEAN Studies Centre, ISEAS–Yusof Ishak Institute has also disputed that such exercises could increase conflict in the sea. “It bears reminding that this maritime exercise with China is not the kind of war games to test combat readiness in conflict simulations,” she said. “It has a practical and constructive purpose of enhancing operational communication and coordination in search and rescue, application of the Code for Unplanned Encounters at Sea, and medical evacuation,” she explained. Also, in the interest of keeping the sea inclusive, a US-ASEAN maritime exercise is already being planned for next year. “ASEAN’s broader vision is to engage not only the great powers but also all partners across the power spectrum to help prevent the regional order from being skewed towards the orbit of any single country,” said Hoang Thi Ha.